I have never been one for publicly making New Years Resolutions. I subconsciously always felt like they were cheesy, unrealistic and they set you up for failure... and honestly it just never occurred to me to make any. But the ironic part to all of that is that I love setting goals and especially in the New Year. Its a pride thing I think. I do much better if I have a goal to reach. I tend to work harder when I have them. I have felt myself getting kind of discontent lately. I saw some things in my life that I wanted to work on but I didn't have the motivation to work on them. The New Year has helped mentally prepare for making some healthy changes in my life. Last week I posted about my 13 goals for 2013. Each of them are fairly managable. It might be 13 in number but they aren't mountains really. Especially if I remember that 2013 consists of 12 months, 52 weeks, 365 days. I don't have to reach all of these goals in January! That's always one of my issues. I set goals and want them completed yesterday. The process and the time can be my biggest block! One of my goals this year is to get healthier. I want to eat better. I want to exercise more consistently. I want to lose the 15 pounds I've gained over the last year. So one of my goals this year is to lose that added weight. I'd love to have this goal be one of the first I achieve and then maintain throughout the year and beyond. This is one of those goals that I can see myself slacking on so I decided to join up with Resolutions in Motion. Having some accountability will help kick my a$$ into gear. Knowing there might be a person or two checking in on my progress is a whip to my motivation. So how do I plan on working towards this goal? Yup I've become that girl. I am counting calories! Its not just about the calories, I know, but the calories help structure my diet throughout the day. I found this great app MyFitnessPal. You track not only calories but your fitness, water intake, etc. It gives you a summary at the end of the day of what percentage of carbs, protein and fat you consumed that day! Its totally free too! I kind of call myself a runner. Although the the last year or so I haven't been as into it. One of my goals in dropping the pounds, and in the year, is to run more. The plan is to run 3 days a week and do other exercise routines 3 days a week. I have Wii that i got a couple of years ago. The Wii Fit Plus has been nice to track my progress and to find decent workout options. 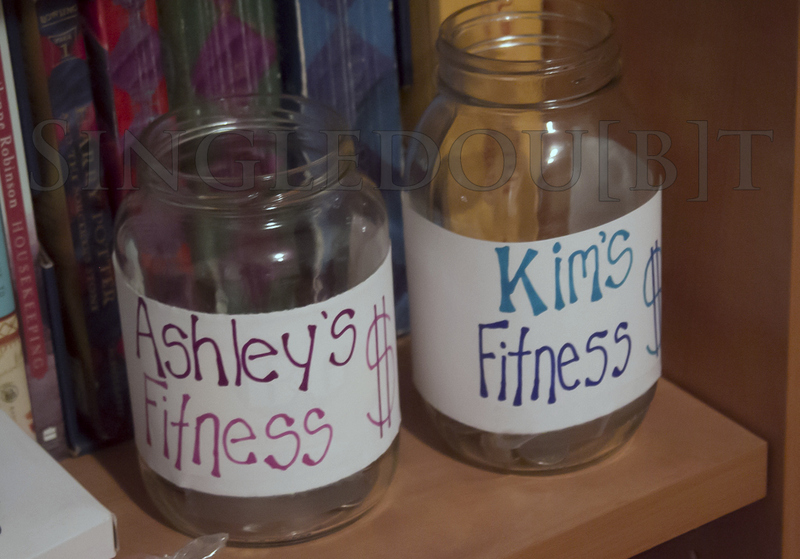 Also, My roommate and I came up with this "tip jar" that will hopefully help motivate us to exercise. Each time we complete a 30 minute exercise related activity, we will give each other $.50. At the end of 3 months we will use that money to do something we wouldn't normally do. Like go to a show or play tourist, etc. I already have $1.50! WOOT! We also made ourselves a goal tracker to help us stay on task. I turned an old photo frame into a dry erase goal tracker. Isn't it cute? So this is one of my 2013 goals! Check back in to see where I am on this one and the other 13. How are you doing with them? Great plan for following through! Love the jars and the board! The jars are a great idea! 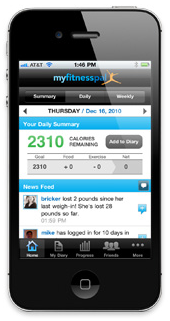 I use myfitnesspal too and I love it! So easy to use and it holds me accountable. Good for you! I joined a gym yesterday to try the same. No more muffin top! Love the goal tracker! 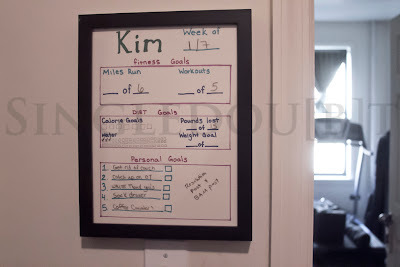 Smart idea and it's always great to have someone to be accountable to! Wow I love these ideas! Really motivational...I also need to kick the extra chub - its a work in progress!